An ice age is a period of time in which the Earth's temperature is too low for the winter ice to melt back fully during summer. Ice ages, of which there have been many, are characterised by massive glaciers covering the subpolar and mountainous parts of the world, and by a lowering of sea levels. Evidence of ice ages was first discovered by Swiss geologists in the 17th century, after they realised that scratched rocks, u-shaped valleys and boulder depositions in the lowlands of the country were similar to glacial effects further up. A very extreme ice age could lead to complete coverage of Earth in an ice sheet. This is often referred to as a "snowball Earth". However, whether this has actually happened in the past (or if it is even possible) is still a hotly debated topic in palaeogeography. By the usual geological definition of the term, an ice age occurs whenever there are fairly extensive ice sheets at the poles, which are the coldest parts of the surface, not taking into account high mountains which are possibly colder because of altitude effects. By this definition, we are still living in an ice age as Antarctica and the counter-intuitively named Greenland are both extensively covered by ice. In the more popular definition used, the term refers to extreme levels of ice coverage, where polar ice extends much closer to the equator than at present. This latter definition is much closer to that of a glaciation. The present ice age has been made up of numerous glacial and interglacial periods, where the Earth has been cold and lukewarm[note 1] respectively. Together, they make up an ice age. However, it is also possible for an ice age to be made up of only a single glacial event — it depends on the underlying cause of the age. The extent of ice covering in the Northern Hemisphere during the last glacial maximum. Note that there doesn't need to be nearly this much ice for the period to count as an ice age. Our knowledge of this aspect of Earth's temperature record is likely to be incomplete, as glaciations tend to obliterate evidence of their predecessors. However, we know of a number of ice ages that have occurred over the course of Earth's history. For further information on these events, see Timeline of glaciation . The Huronian glaciation is the earliest known ice age, caused by the oxygen catastrophe. This was because the build-up of oxygen in the Earth's atmosphere oxidised the atmospheric methane. This ice age began around 2.4 billion years ago, and lasted 300 million years. It was one of the most severe of all the ice ages. The Cryogenian was a geologic period from 850 to 635 million years ago. This period included both the Sturtian and Marinoan glaciations, the greatest glaciations known. [note 2] It is these glaciations that are the basis of the concept of the "snowball Earth," however there is much controversy as to whether they entailed a global glacier, or whether the term should instead be "slushball Earth." It is argued that photosynthesising life could not have survived in a world covered completely by ice — breaks in the coating must have existed throughout. A third, earlier glaciation may also have occurred during this period — the Kaigas. However, this is debated. Also taking place in the Cryogenian was the breakup of the supercontinent Rodinia and the formation of the supercontinent Pannotia — It is not impossible that this had something to do with the glaciations. We have evidence of glaciation between 460 and 430 million years ago in the Andes mountains, Arabia, the central Sahara, the lower Amazon, and Western Africa (in no particular order). At this time these areas were part of the continent of Gondwana, which was located where Antarctica is now. The Karoo ice age was between 360 and 260 million years ago. It was caused by the formation of the supercontinent of Pangea and the associated closure of the Rheic and Iapetus Oceans. We know of two glaciations in this ice age, centred in different locations — in the first, from 359.2 to 318.1 mya, glaciers expanded from what is now Africa and South America; in the second, 318.1–299 mya, they were centred in Australia and India. The Quaternary glaciation began 2.58 million years ago and continues to the present, and is thus the current ice age. This ice age is the most well known, for obvious reasons, and has so far included dozens of glacial and interglacial periods. The precise cause of the last ice age is unknown. It probably had something to do with astronomical cycles, the composition of the atmosphere, plate tectonics and/or ocean currents. Whatever the cause, the Earth's temperature has been cycling between the present temperature and bloody freezing for the last two and a half million years. 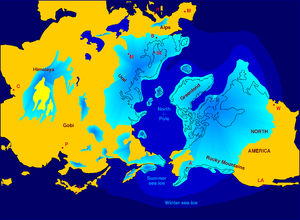 During the height of the glacial periods, ice sheets covered much of Northern Europe and North America; in interglacials this reduced to merely Greenland and Antarctica. The majority of the variability in ice cover, therefore, has been in the Northern Hemisphere — this is in contrast to many of the previous ice ages which have been Southern Hemisphere-based. The glaciations of the last hundred thousand years or so have repeated in a 40,000 year cycle related to the changes in the Earth's orbit around the Sun, with the Earth coming out of glaciation when the time of Perihelion (when earth is closest to the Sun) aligns with the summer solstice of the Southern Hemisphere. Deglaciations tend to be fairly rapid, while the descent back into cooler weather happens much slower. The last glacial maximum was around 18,000 years ago, and we entered the present interglacial 10,000 years ago — but we are by no means out of the ice age as a whole. Since then the climate has fluctuated around the average temperature of 15 degrees Celsius. Due to the nature of the return to glaciation in this particular ice age it is possible that the cooling period known as the "little ice age" was, in fact, the first sign of this - certainly, there was much fear around the 1960's that we were slipping back into one. In 1971, Gordon Rattray Taylor's scaremongering non-fiction The Doomsday Book predicted that temperatures would fall by 4° F (2.2° C) by 1975 with a new ice age due by 1980. However, by the 1970s evidence mounted that – within only a few years – warming caused by emissions of CO2 would overwhelm any natural cooling trend. The average temperature of Earth's troposphere has been steadily increasing since the 1980s, and there is no indication that glaciers will make it to the borders of London any time soon. Runaway global warming, with the methane trapped in the permafrost being released etc, turns the Earth into a clone of Venus. [note 3] The oceans boil, water splits into its component hydrogen and oxygen, lead melts... that kind of thing. Runaway global warming is sufficient to permanently break us out of this ice age, but the Venus thing doesn't happen. Things get toasty for a few hundred or thousand years, but in 20,000 years we're covered in glaciers nonetheless. Global warming is a hoax perpetrated by liberals, and any temperature increase in the short term is just part of a natural cycle: we freeze anyway. At this stage we can probably rule out the last two, but the rest remain contenders. ↑ Like it is now. ↑ Though not all of the period was glaciation. ↑ The planet, not the Goddess. ↑ Or rather, the Gulf Stream ceases to reach Europe, causing a freeze there that increases the albedo of the Earth as a whole, cooling the planet. ↑ Quaternary Ice Ages and Dating Techniques These glaciation remains have since been found in many parts of the world, and have been dated to several geological periods. ↑ See the Wikipedia article on Huronian glaciation. ↑ See the Wikipedia article on Cryogenian. ↑ See the Wikipedia article on Snowball Earth..
↑ See the Wikipedia article on Karoo Ice Age. ↑ See the Wikipedia article on Quaternary glaciation.